Pogo Joe is a Q*Bert clone with several extra features. The player takes the role of the eponymous Pogo Joe, a boy on a pogo stick. The game takes place over 65 different levels, each consisting of a different arrangement of barrels. To complete a level, Pogo Joe must jump on every barrel. To make Pogo Joe's job harder, several enemies inhabit the levels. They first start out as spherical "eggs" of different colours. Colliding with these "eggs" kills the enemy within them, but if left alone for a few seconds, the "eggs" hatch into different sorts of enemies, contact with which is fatal to Pogo Joe. The barrel has been jumped on. The barrel has been jumped on twice (required on some levels). The barrel has been jumped on three times (required on some levels). A "smart bomb" barrel. Jumping on this kills every enemy on screen, and reverts the barrel to white. A teleport. Moves Pogo Joes instantly to another black-topped barrel. On later levels, some enemies change red barrels back to white when jumping on them. 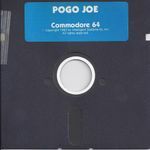 Source: Wikipedia, "Pogo Joe", available under the CC-BY-SA License.